Adventure #273 (Jun 1960) - Around the World in 80 Hours! Aquaman and Aqualad swim around the world in 80 hours for charity. Aquaman's estimated time between bodies of water! This is set over a map showing the route. Finny Friends Report: Giant squid squirt ink at planes attacking Aquaman and Aqualad. Flying fish form an SOS to summon a military task force to deal with an attacking submarine. Sharks and sawfish prepare sheets of lead to wrap the pair and protect them from atomic fallout. Octopi wrap the pair in lead. A story with this plotline was published in More Fun #86 (December 1942). While the plot is the same, Aquaman racing across the world, the events are different. In the Golden Age tale, Aquaman goes to Hollywood and the project is for a charity film, and he has seven days. In the older tale, he faces water covered in oil and set on fire, bombs and depth charges, drugged water (and is actually captured by the Japanese), a muddy channel where he is attacked by Japanese bombers, and finally fake cameramen with guns. He makes it in less than six days. 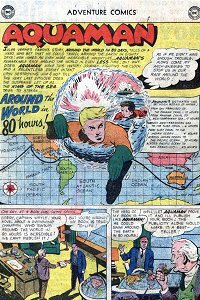 In this tale, Aquaman and Aqualad are attacked by planes in a shallow area (similar to the muddy channel), torpedoed after they leave the Panama Canal, have to get through a radioactive Indian Ocean, enter a minefield, and have to cross an arid island. Aquaman carries waterproof matches and capsules of oxygen and hydrogen in his belt kit so he can make water if he needs it. Which no doubt he will, since he announces his one hour weakness on international news.